Lucio Kansuet’s art reclaims for us the wonders of the seventh day, when a pure and pristine world was put in human hands. It revives that strange and ever-present thirst for innocence and the longing for an untouched, intimate and eternal paradise that is common to most cultures, portrayed in the Western world in the biblical story of Eden Lost, as well as in the mythic Golden Age of Greek tradition. More than a specific geographic place, humanity’s collective memory seems to hold reminiscences of a state of grace in which the relationship with nature was imbued with equilibrium, respect and harmony. For us, the banished sons of Eve, the product of asphalt and steel, the relationship with the natural environment can only be experienced as something distant, a yearning, a utopia. It is for this reason that Kansuet’s paintings reveal a rare emotional and existential dimension: Kansuet has not left paradise, Kansuet lives within it. In his paintings, there is evidence of a deep veneration for nature and for that combination of heavenliness and earthiness that is so alive in his people’s legendary poems, passed down by the ancestors of his race, which speak of our species’ initial brotherhood with beasts and plants, in vivid contrast with the tyrannical dominion over nature that characterizes our modern societies. The workings of an ancestral, inherited memory allow Lucio Kansuet to turn, without impositions, to the source of that symbiotic relationship with the Earth which still seems to be one of life’s ideals, even in this skeptic postmodern era, which takes for granted that great utopias are impossible. In Kansuet’s young body of work, one can appreciate a constant arsenal of symbols that he adheres to, even though he offers no stories, because his purpose is not to narrate, but rather to make visible a particular condition. The painter has expressly tried to introduce elements, whether explicit or hidden, that have meaning in the Kuna culture and--even though the process for selecting these elements is mostly intuitive-- at no time does his work seem cryptic or obscure to viewers from other communities. On the contrary, he communicates with observers by appealing to human conventions that go beyond any mythic key that, due to their specificity, might run the danger of being exclusionary. Thus, the seed as a metaphor for life and childhood as a state of perfection conforms the axis around which revolve the inner workings of his art. Human offspring appear protected within cocoons or pods, seeds, fallen leaves, spawns or fruit, natural enclosures that represent our relationship of interdependence with our environment. In previous exhibitions, the children in his paintings have been asleep but now, in this show, their eyes are beginning to open. Even though they are still lying down, they gaze at the viewer with a serene and peaceful look, which is sometimes slightly questioning. Other children are standing, joining the vigil with open eyes that may never close again. Still, even in these recent images, there is a predominant dreaminess, which triggers in the viewer a feeling of being a lighter, less physical entity. It is as if contact with the simulated gaze from the canvas could make us fade away like dreams, or as if we had been relieved of the burden of our everyday lives. The fact is that the expressions of these characters, so lost in thought, make any sort of superficial contemplation impossible and their eyes, so awake and bright, seem to demand the viewer’s attention. On the formal level, Kansuet is a virtuoso. In his paintings, one perceives incredible handling of light and an ability to manage color through a palette of coppery skin tones that contrast with the fresh hues of his backgrounds. His impeccably rendered works are based on glazes, thin layers of oil paint applied with almost imperceptible brushstrokes. Within a solid compositional framework, his masterful and technically refined draftsmanship and delineation of the human figure are vivid examples of the abilities that have been lost over just a few decades in contemporary artistic circles, now inclined towards more conceptual creative productions. Even though his exceptional handling of composition and human figures is based on a completely classical tradition, the direction of his oeuvre may surprise us in the future. At this time, his work is in an interesting stage of transition that announces a search for the universal, moving away from identifiable local ideas. Throughout his production, the motifs in the background of his paintings have been changing slowly but surely. In earlier works, thick tropical jungle settings –always recognizable in spite of their aura of “cultured” nature—reign supreme, both as backgrounds and protagonists. This constant feature has slowly yielded to more abstract backgrounds and environments. There has been a process of refinement and simplification that does not imply that he has abandoned his alliance with nature, but rather is the result of an aspiration to go beyond –from a phenomenological point of view—the limits of observable reality, in order to materialize that which escapes our ordinary perception. And what escapes our ordinary perception is the human condition, which is painful and complex. For Lucio Kansuet, man is nature and artifice; nature as proven by his physical and biological origins; we come from the Earth, we are born from her. Artifice because his tragedy is his own self-consciousness as a changeable being, in a way foreign to nature, because man is not subject to his instincts like the rest of the animate beings around him. Rather, he can transfigure his circumstances and add new objects to reality, for better or for worse. Part of the artist’s metaphysical effort in his most recent creations is geared towards closing this gap. The product of this effort, an illusory image so seductive that it can easily replace reality, is in no way an accusation, but rather a gentle manifesto in favor of going back to the seed, of returning to the earth. 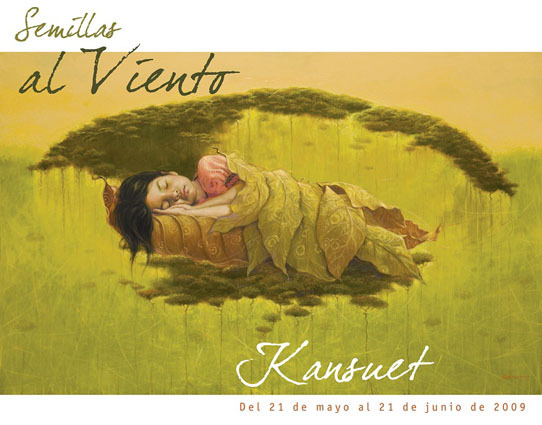 In the end, Kansuet’s work leaves us with a promise, with the hope of retrieving our lost innocence, with a quiet call to amend our relationship with nature. June 25th - July 30th, 2009 (+info).